Director Don Bluth collaborated with Steven. It was Spielberg’s first experience in animated film and he freely admits he was shocked how complicated it was to add even a two minute scene. I’m guessing that may have presented a problem when it came to tossing in his WOO inspirations. Still a handful stand out, too classic to miss. A storm overtakes the immigrants’ ship at sea. Spielberg who helped write the script surely inserted his tried and true tension builder, stormy skies presaging life changes and dangers ahead. See Twister, War of the Worlds, Poltergeist, Close Encounters, Joe vs. the Volcano. A door at the head of the stairs blows open and flaps in the wind, showing enticing glimpses of the outside world. Fievel is lured away from safety in the same way Dorothy and so many Spielberg protagonists are. See Close Encounters, Sugarland Express, Lincoln, Saving Private Ryan, 1941, Poltergeist for others who get enticed through doors. See Empire of the Sun, Catch Me if You Can, Hook, Twilight Zone the Movie Kick the can Episode, Joe Vs. the Volcano, Poltergeist for other ill-fated droughts. Like Dorothy valuing her dog Toto above all else, like Jamie disobeying his mother to scoop up his toy plane in Empire of the Sun, Fievel chases after his hat… and the adventure begins. Dom DeLuise gives a terrific homage to Bert Lahr’s Cowardly Lion as the cat named Tiger. “Somewhere out there…” showcases the hero’s innocence through song. Steven uses it again in Empire of the Sun. Like Dorothy, these characters’ purity of heart remains uncompromised by evil surrounding them. Spielberg gives it another go with the daughter in Hook. That scene flopped for me and maybe for him as well…I don’t think he’s used the device since. I had a hard time deciding who the trickster was. At first I thought it would be Warren T. Rat, but he was a red herring. Tony, with his street smarts, turns out to be the real McCoy. 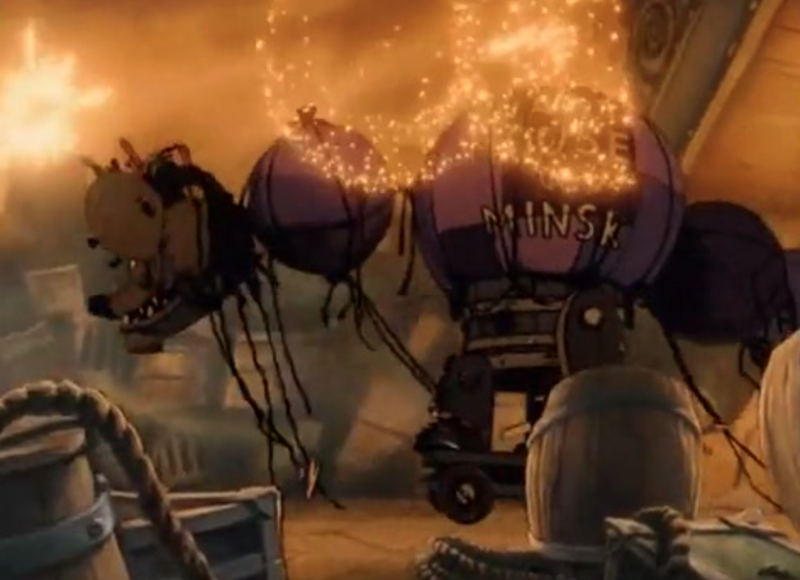 The giant Mouse of Minsk, the rodents’ secret weapon, is made from hot air balloons. 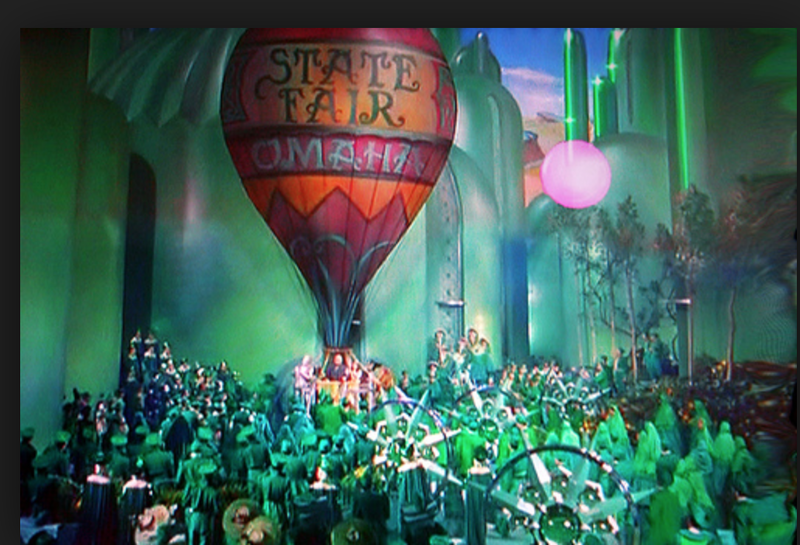 This sinister aspect to balloons will be later re-visited in A.I. It’s funny. As a kid, I always felt concern for Dorothy getting into that rickety balloon rig with Professor Marvel/the Wizard. It seemed too risky. Did Steven’s subconscious imprint him with a similar balloon dread?